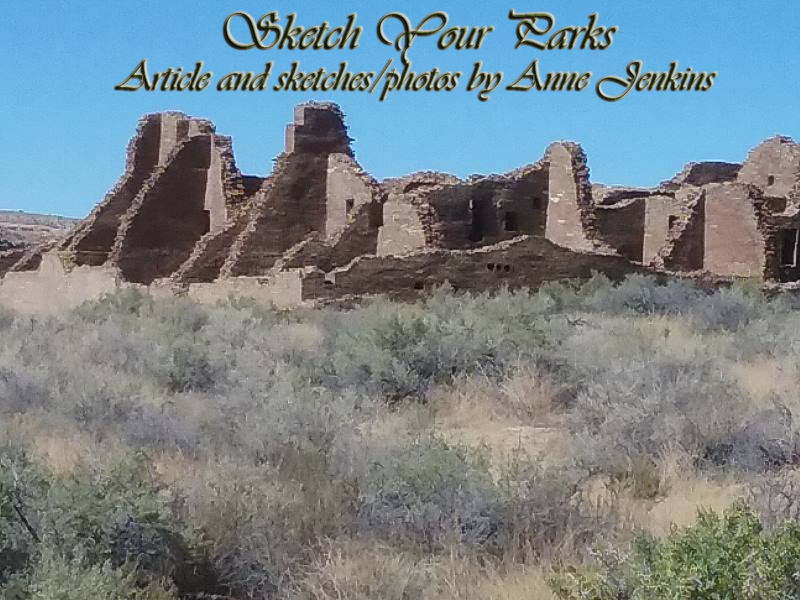 This sampling, in no particular order or preference, is to encourage you to go visit your parks whether you sketch or not. Cedar Pass Cafe in the Badlands National Park, S.D. The Badlands National Park in South Dakota features surreal landscape, vast vistas with ragged bluffs, deep canyons and curious critters from buffalo, pronghorn and big horned sheep to the cuteness overload of prairie dogs. The animals are fabulous to sketch, if you can, when I draw animals they look like they've been smoking funny cigarettes. The Badlands must have been a terrifying sight to settlers as they traveled across in a wagon. Luckily for us today, the view from the comfort of a car mesmerizes. There are plenty of parking areas and short trails. Spend a few days here to really explore but, if pushed for time, you can do a lot in one day. Beauty, art and war. The horrific battles and massive loss of life at Antietem during the Civil War are difficult to comprehend today, and touring the park in Maryland is a sobering experience. There is an amazing exhibit of sketches and paintings in the Visitor's Center that were done during the war by Captain James Hope of the 2nd Vermont Infantry. These sketches and the scenes of battle and hardship, make it a contrasting visual against the bucolic tranquility of the park today. The horrors of war are shown through art. rather appropriately, of a field hospital. New Mexico boasts a host of fabulous national parks, with the likes of White Sands National Monument and Carlsbad Caverns being among the best known. One hidden jewel tucked in the North Eastern corner of the state is Capulin Volcano National Monument. The arrow head shape of the volcano rises about 7800 feet above the desert plains and towers over smaller volcanoes in the region. It's a steep drive to the base of the rim, and a short hike up, but the view is spectacular and makes for rewarding sketching time. Capulin Volcano with a stunning view from 7800 feet. "This place was not deserted. 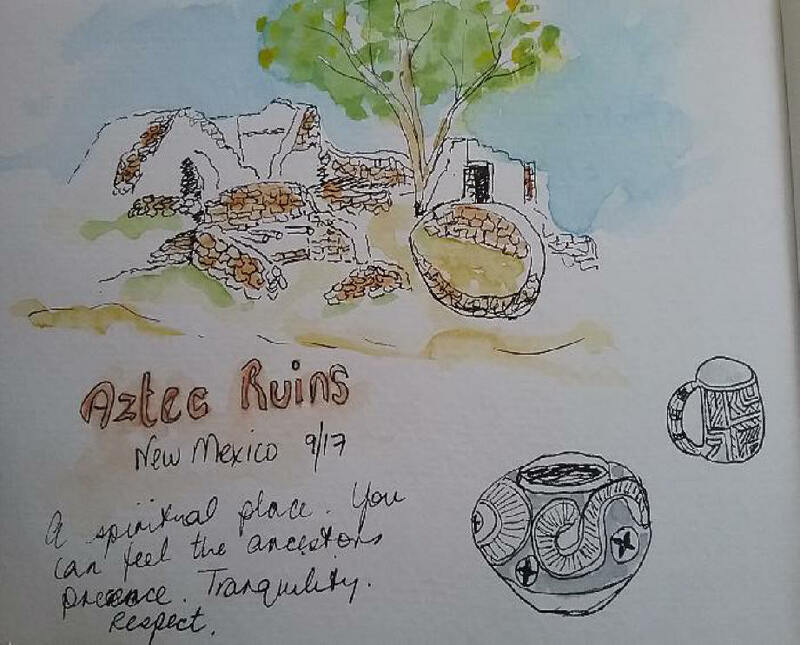 The spirits of our ancestors are still here," to paraphrase a wise Hopi lady about the Aztec Ruins National Monument in Aztec, New Mexico. It is a spiritual place. It's also a bit of a misnomer. The community wasn't built by the Aztecs but by the Chaco People. A giant kiva, a meeting house, has been reconstructed and gives a fascinating glimpse in to the past cultures of the area. The architecture and planning of the whole place is quite astounding, beautifully done and very tranquil. It is not a large area, but take your time and explore. There is a nice little shaded park for a picnic as you gaze at the ruins and finish your sketches. New Mexico got messy, but that happens. 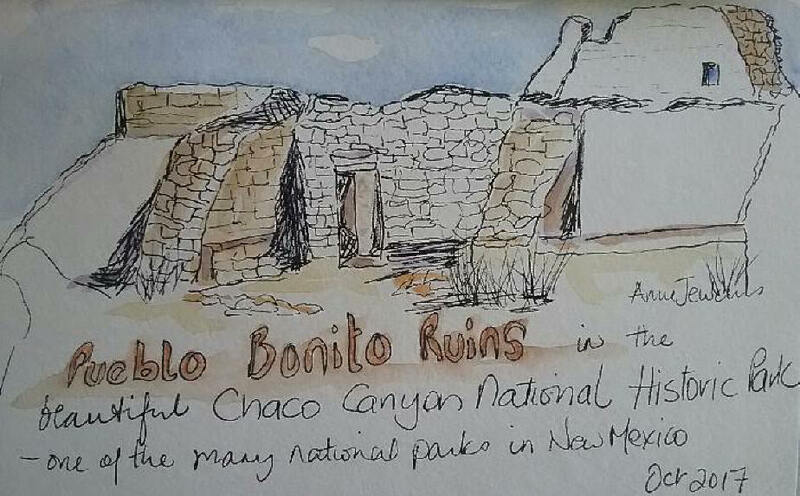 A couple of hours south of Aztec in an isolated high desert is the Chaco Culture National Historic Park. Large ancestral pueblos were constructed here thousands of years ago. It never had a large permanent population and it is believed to have been used mostly as a ceremonial gathering place, plus as a trading hub. Pueblo Bonito is the best preserved and the rangers give informative guided tours regularly. The road in to the park is rough, so allow plenty of time to get there. A visit to this park is a rare treat. One of the lesser known parks is the spectacular Big Bend National Park in the far corner of West Texas. And in true Texan style it is massive in scale, and majestic. The park lies nestled in the U of the Rio Grande as it winds and twists along the border of Mexico and the U.S. At times the river seems little more than a stream and others a wide sea in the desert. Most of the park lies in the massive Chihuahuan Desert and the Chisos mountain range dominates the center. It teams with bird life, and If you're luck you'll see the surrounding desert come alive with wild flowers after a soaking rain. It seems as if around every corner is another surprising and spectacular view. It takes a couple of hours to just drive across part of the park on one of the trails, so definitely give yourself a few days to explore it and do it justice. You don't happen to stumble across Big Bend, you have to plan, it's far from anywhere but so very worth the trip. the US on the close side in Big Bend National Park, Texas. The NPS has a great many interesting programs and events suited to each individual park. And for artists one of the great programs is their offer of an Artist in Residence (AIR). Not all the parks have this program and all participating parks manage their own AIR program. They are open to painters, writers, musicians, sculptors, photographers and most offer rudimentary or rustic accommodation which adds to the atmosphere. Some ask for a donation of a piece of work, or interaction with the public while there. Your National Parks are a national treasure, to lose even a few acres of these parks is tragic and they cannot be replaced. Not only to do they teach the history of the U.S., they also make citizens proud of their beautiful country. Plus they are a magnet to foreign tourists. So, no matter if you're an artist or not, "go find your park," as the NPS says in their promotional material. Try to visit as many, if not all of them, as you can. I have no doubt you will be rewarded.